Editor’s Note: This week, thousands of HISD seniors will receive their diplomas during graduation ceremonies across the district. Many of our students have overcome challenging circumstances during their educational journeys. We are sharing a few of their stories this week. Ludreche Bouanga was 11 years old when he moved to Houston with his family from Gabon, a country bisected by the equator on the Atlantic coast of Africa. 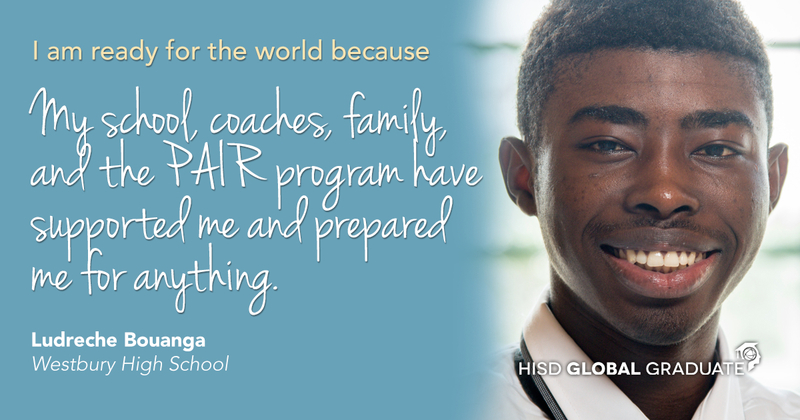 The young refugee spoke no English and knew little about American culture when he started as a middle-school student in HISD. Seven years later, the 18-year-old is graduating from Westbury High School with a scholarship to attend Allen Community College in Kansas, where he plans to study physical therapy and run track and cross country. As a longtime volunteer for the Partnership for the Advancement and Immersion of Refugees, a nonprofit that supports newcomers to Houston, Ludreche is also committed to supporting other young newcomers to the United States. Westbury Principal Susan Monaghan describes Ludreche as a “born leader.” “He is going to be successful in life no matter what he decides to do,” she said. With his upcoming move to college, Ludreche admits he is both nervous and excited about this latest challenge. “I’ll just have to focus on my goal and remember why I’m there,” he said. This entry was posted in Achievement/Recognition, District IX - Wanda Adams and tagged Westbury High School on May 26, 2016 by HISD Communications.